This month we will be learning about: Cauliflower, Avocados, Yams, and Grapes We will be reading: The Surprize Garden, Black Belt Bunny, Pick A Circle, Gather Squares and Pa Grape’s Shapes. You can cuddle up and read these great books with your child at home too. Surprise Parent Readers Anytime: How would you like to be a surprise reader for our storytimes? You can schedule at your usual drop off time, pickup time or anytime in between. Don’t forget it’s a surprise, so don’t let the children in on the secret. You can come in dressed up as a character from the story or just come as you are. It’s up to you. The sky is the limit. Signup here. Staff Development Training 11/06 & 11/07: Talk Time Giving Children Words They Need |Every month our teachers learn something new, takes a look at something old from a new perspective, reinforces and reinvigorates previous education and training, or just have some hands-on fun through our regular training programs. |In addition to our in house training, we receive coaching from Child360 (aka LAUP). Several times a month our Child360 coaches visit and help us improve our parent, children and co-worker interactions. They help us: pinpoint areas to improve, set goals and implement action plans. Learn more about our happy teachers here. 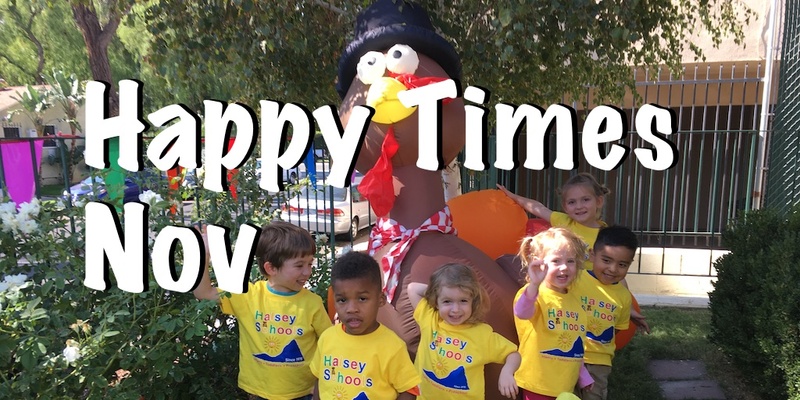 Field Trip 11/8: 9:30 – 12:00 Jump Around Lunch at School | 21515 Parthenia St #1, Canoga Park | 818-993-5867 | Please sign up here. |Field trips are available for Busy Bees, Dragonflies, Penguins & Panda 3+ years old and potty trained. All children must wear their Halsey Shirt on all field trips. If your child is in the Panda class, he/she may attend the trip if you or your spouse or other loved one join us. Parents are always welcome to attend and space is limited. So let us know if you want to join us right away. Sign up Field Trips here. Visitor 11/13: An avocado farmer comes to visit us at the preschool 10-11. Thanksgiving Social 11/16: Come and join us for a special sing a long and some tasty treats!!! Infants-9:30, Tiny Tots- 10:00, Toddlers- 10:30, Preschool- 11:00. School Closed 11/22-23: Thanksgiving – Have a wonderful and thankful weekend full of family, friends and food. Holiday Plans: At Halsey Schools we understand the importance of family togetherness. As a result, whenever possible we like to give our teachers special time to spend with their families. The Holiday Season provides an excellent opportunity to do so. In order to plan for this, we need your help. Please complete What are your Holiday Plans? Hot Beverages: As the days and mornings become cooler, please remember to keep coffee and other hot beverages off campus. For safety reasons, there is no drinking of hot beverages allowed on any of Halsey Schools grounds, or on any Halsey Schools trips or other events. If you would like to drink hot beverages, please do so off campus or before coming in. Sheets & Blankets: All children must have a sheet & blanket for nap time everyday. Please make sure to send a sheet & blanket at the start of the week. Please have your child’s name printed on them. Thank you! Cold & Flu Season: We are now officially in the Cold & Flu Season. At Halsey Schools, we follow our written Illness Policy and written illness prevention procedures. We make every effort to assure your child contracts as few illnesses as possible. However, most children and adults will contract at least one illness between now and April. Remember to wash your child’s hands everyday before leaving school or any other social event.